Got game? If you play too long, you might have gamer’s thumb, too. 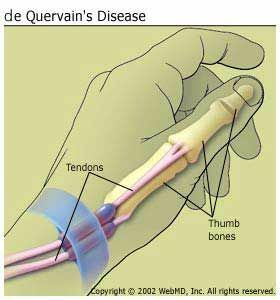 Its proper name is de Quervain's tenosynovitis, but you could also hear it called de Quervain’s disease or de Quervain’s syndrome. It’s a painful inflammation of tendons in your wrist and lower thumb. When the swollen tendons rub against the narrow tunnel they pass through, it causes pain at the base of your thumb and into the lower arm. Age. Adults between 30 and 50 are most likely to get it. Gender. Women are 8 to 10 times more likely to get it than men. Motherhood. It often happens just after pregnancy. Lifting your little bundle of joy repeatedly might bring it on. Motions. You can get the condition if you move your wrist over and over again, whether it’s for fun or for work. Pain along the back of your thumb, directly over the two tendons. The condition can happen gradually or start suddenly. In either case, the pain may travel into your thumb or up your forearm. It may be hard and painful to move your thumb, particularly when you try to pinch or grasp things. The pain may get worse when you move your thumb or wrist. The doctor will check your hand to see if it hurts when he puts pressure on the thumb side of your wrist. Next, you’ll get the Finkelstein test. The doctor will ask you to bend your thumb across your palm. Then you’ll bend your fingers down over your thumb to make a fist. This movement stretches your tendons. If it hurts on the thumb side of your wrist, you probably have de Quervain's tenosynovitis. Medications. You’ll start with over-the-counter pain relievers like ibuprofen or naproxen to ease the swelling. If that doesn’t work, your doctor may inject steroids into the tight covering, or sheath, that surrounds your tendon. If you do this within 6 months after you notice symptoms, you might fully recover with no more treatment. Splint and physical therapy. Your doctor will probably order a splint that will hold your thumb and wrist firm and still. You’ll wear it 24 hours a day for 4 to 6 weeks. You will also receive therapy to teach you exercises to build strength in your wrist, hand, and arm. Surgery. If these treatments don’t help, your doctor may recommend surgery. The operation releases the tendon sheath so your tendon can move smoothly. It’s an outpatient procedure, which means you go home just afterward. You'll probably see the physical therapist again for post-surgery exercises to strengthen your thumb and wrist. Ice the area to ease inflammation. Stop doing anything that makes it worse. Avoid repeated motions and pinching moves with your fingers and thumb. Wear the splint as long as your doctor tells you to. If you didn’t need surgery, you’ll probably get better in 4-6 weeks if you wear your splint, do your exercises, and avoid movements that irritate your tendon. Recovery from surgery could take a while. Your pain and swelling should go away soon, but the area may be tender for several months. You should get your stitches out in 10 to 14 days. Then you’ll start physical therapy again for 6 to 8 weeks. You’ll learn stretches to help your tendons move properly and exercises to strengthen your muscles and keep your joints steady. News release, American Academy of Orthopaedic Surgeons.